Founded by Urvashi Patole in 2011, The Bikerni’s aim is to promote female motorcyclists in India and provide them with a platform to connect with other female enthusiasts and improve their skills. They want to shatter all gender stereotypes and encourage other women to fearlessly follow their passion for motorcycles. India is spearheading women empowerment through the medium of motorcycles and encouraging women to go on adventures they would have never thought to go on before. Apart from this, The Bikerni is also the only club to get recognised by the most prestigious body in the women’s motorcycling, WIMA (Women’s International Motorcycle Association). This group of extremely driven women who celebrate their individuality and shared a love for biking is extremely efficient when it comes to any knowledge related to bikes. From changing tires to fixing clutch wires, they have aced it all. 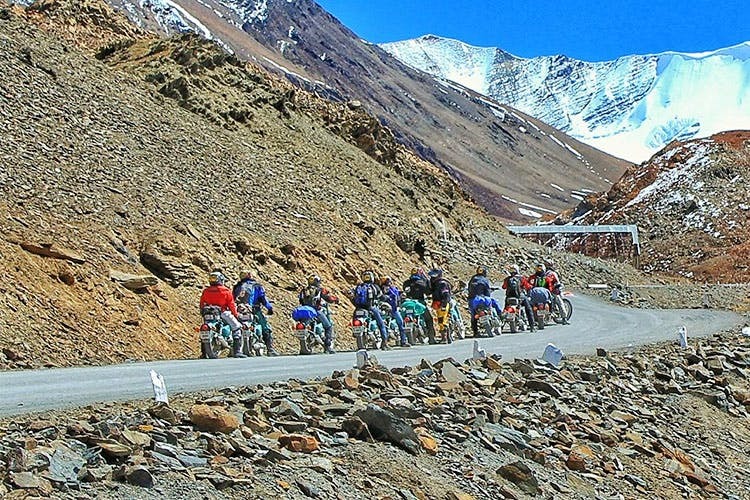 The Bikerni also holds a Limca Record for organising the largest all-women motorcycle expedition to Khardung-La, which is the highest motorable road from Delhi to Nubra Valley. The Bikerni believes that biking is a source of Nirvana and it welcomes like-minded women with open heart. The current group has members from the age group of 17 to 57 from different backgrounds. You can fill this form here to register for the group, although they have a few conditions. To qualify as a full-time member you need to complete three mandatory rides with fellow members of The Bikerni. You can ride on any brand, type or make of motorcycles. They have separate rides for scooter/moped class which are dedicated to short distances. Their biking tours happen across several cities. Each city has one ride once in a month which is followed by a regional/zone meeting once in every three months and various workshops. The Bikerni is fierce, passionate and adventurous. “Don’t mess with us, you will only see dust far ahead in front of you,” they say. Well, we are completely smitten and we are sure so are you. Read more about them on their Facebook page.